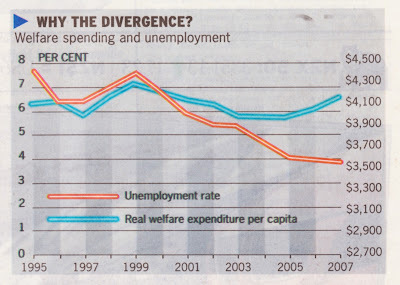 This is a telling graph from Infometrics published in this morning's Dominion Post. The column is entitled When working becomes a casual choice. Quite. "The current government likes to play the part of the all-powerful provider. If you take tax of the workers and hand it around, you might make more enemies than friends. You may bribe students, increase the number of people on welfare and, instead of simply cutting taxes for nine years, hand out billions in badly designed packages such as Working for Families." Amen to that. I can never figure out why the promise not to take money off people is less persuasive than the promise to take it and throw it around. Whatever it is, the acceptance is deeply ingrained in the New Zealand psyche. "Returning New Zealand's living standards to the top half of the OECD is up to us. We can achieve this by working both harder and smarter. It's time we stopped looking to the government with outstretched hands and got on with the job ourselves." And therein may lie the answer to my previous puzzlement. Perhaps too many New Zealanders are just too lazy and insecure to look after themselves. VICTORIA'S curriculum is left-wing and is pressuring students to conform to the politically correct views held in school texts and by teachers to enhance their chance of academic success, a Melbourne tutor has warned. In a submission to a federal inquiry into academic freedom, Mark Lopez argues that — in year 12 English in particular — students with non-left views face "additional challenges" and are often disadvantaged if they "cross the teacher's bias". Dr Lopez, a humanities tutor of 18 years, told the Senate inquiry that, in part, he set up his tutoring business to tackle issues of ideological bias, teacher quality and the "subjective" assessment of students' work. "The problem of bias is much worse than many assume," he said in his submission. His concerns are echoed by conservative education consultant Kevin Donnelly, who warns in his submission that some students left school "culturally illiterate and ethically challenged" because they were denied the opportunity to study history or literature "in any systematic or balanced way". Dr Donnelly said education should be balanced, impartial and disinterested — but he said a lot of students were taught a politically correct view, rather than a balanced view. "There are serious consequences for young people in terms of not getting a balanced education," Dr Donnelly told The Age. "One of them is that a lot of young people don't have a strong moral compass." Aaah. But perhaps they have that much vaunted 'social conscience' the left promulgates. And a sense of 'social justice' too. Never mind that both centre on the government as the giver of all that is good. Or better. Education vouchers that would allow parents to choose a school that taught their children how to think - not what to think. § To introduce a flat rate 18% personal tax and GST rate. "This will incentivise everyone in the country to earn more" says Mr Rankin. This could put the cat amongst the kereru. Can't wait for the debate about the Super age. Based on the usual collectivist, special interest, left-wing notions why shouldn't Maori qualify earlier? Why do we have a Ministry of Women's Affairs? Why do we have separate Maori seats? Why do we have a widow's benefit but no widower's benefit? Think I might listen in to JT on Radio Live this afternoon. Auckland University post-graduate researcher, Christine Todd, argues in today's NZ Herald that single parent families are stigmatised, misrepresented and misunderstood in Social Stigma makes parenting alone that much harder. Stigmas exist however to reduce behaviours that are detrimental to the individual and society but in the modern world many stigmas have disappeared and we are both advantaged and disadvantaged by this. Certainly to be a young and unmarried mother is now quite unremarkable. Some wear their pregnancy as a badge of honour often believing that impending fatherhood will bind her 'partner' to her. Clearly this is a misapprehension on her part. But instead of dealing with subjective attitudes let's look at the facts. Ms Todd says that only 3 percent of sole mothers are under 20 and almost 60 percent are Pakeha. One assumes she is referring to those sole mothers who rely on the DPB as there is very little known about those who do not. 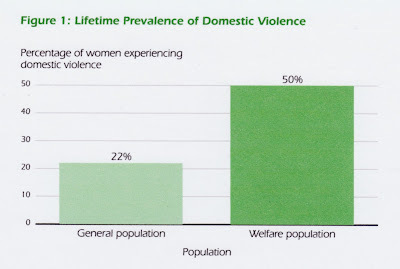 The statistics for the DPB that are readily available cover all recipients including other 'carers 'and 'women alone'. But the vast majority are female single parents. While only 3.5 percent are aged 18 to 19 that is to be expected as DPB receipt occurs across a broad range of ages. What matters is that up to half of single parents currently on welfare began there as teenagers. In 2007 alone 2,252 teenagers received a sickness benefit for pregnancy or pregnancy-related reasons. It is incorrect to claim that "almost 60 percent are Pakeha." In fact according to the Ministry of Social Development, at December 2007, only 38 percent of single parents on welfare were NZ European; 42 percent were Maori, 10 percent Pacific and a further 10 percent belonged to other ethnic groups. So as much as Ms Todd would like to dispel "stereotypes" there is a greater likelihood of a DPB mum being Maori and there is a greater likelihood of a DPB mum being single as opposed to separated. That is not to deny the existence of the group that she has been associated with during the course of her research. DPB recipients are a diverse group, some of whom end up on it through no fault of their own. But there is a large sub-group who have defaulted to it in preference to low paid work. They are not necessarily the conscientious parents Todd has dealt with and describes. 1990s research showed a child in a DPB home was four times more likely to be the subject of a notification to Child Youth and Family. Here is the policy problem. Do we put more money and resources into single parent families - higher benefit levels and other forms of financial assistance - in an effort to alleviate their 'poverty' or do we look at ways to discourage the formation of such families in the first place? It seems that we cannot do both as the first course of action has been shown to draw more people into single parenthood and on to benefits. Todd argues that policy makers have an obligation to meet the needs and values of single mothers. If that holds true policy makers also have an obligation to meet the needs and values of every other group in society, children for instance. Are their needs met by the state continuing to take the place of fathers? Few people would answer that question positively. If women do not want to be faced with the "extremely difficult and exhausting" task of having to combine parenting and paid work they need to avoid putting themselves in that situation. There are an increasing number of people who feel disinclined to pay for problems that could have been avoided. They are struggling themselves to combine parenting and paid work but do not suggest it is somebody else's job to accommodate them. One of the prime reasons for negative attitudes to DPB mothers is not that they are single and raising children but that they want other people to pay for their choices. But if we do not soon begin to reinforce personal responsibility as a value that should be embraced by all groups then as a society we will continue on down a pathway of increasing family disruption and dysfunction. A new study claims almost ten percent of New Zealand women experience domestic violence while pregnant. Auckland University reached the finding after interviewing almost 3,000 women about their experiences of abuse. It found three quarters of women who had beaten while pregnant were abused by the same person, usually the child's father, before they became pregnant. It seems to me that either the EMA or DPB (or sickness benefit for that matter - in 2007 2,252 16-19 year-olds received a sickness benefit for pregnancy related reasons) is a two-edged sword for young women. On the one hand, as the common argument goes, the assistance gives her a chance to remove herself and any other children from an abusive partner (although it is doubtful whether he would ever have been financially supporting her in the first place.) On the other, however, it gives him a strong motivation to control and pursue her. The best protection for young women is education and increased work-related earnings. These have been shown to decrease the likelihood of experiencing domestic violence. But how often do you hear them being suggested? The Centre for Independent Studies has been floating this idea for a while. People should be able to opt out of the welfare state. Now they have taken it a step further suggesting people who are dependent and can't run their own lives should declare their position and then forfeit rights to do other things like vote and sit on juries. As the essay writer says, if they can't be trusted to run their own lives why would you trust them to run other people's by selecting governments? I have immediate questions like why should a person genuinely disabled through no fault of their own or a superannuitant for instance, forfeit these rights? The paper probably answers it but I haven't read through the 43 pages yet. My gut reaction is declaring independence is attractive but declaring dependence is fraught. Also the paper asserts that the individual has to earn the right to own his own life. Yikes. But it certainly makes for interesting reading. I have scanned a couple of extracts from the introduction below the precis. Peter Saunders edits this collection of essays which argue that in a time when governments are running up enormous welfare bills and intrusively regulating everyday life, many people do not need to rely on the government to survive. 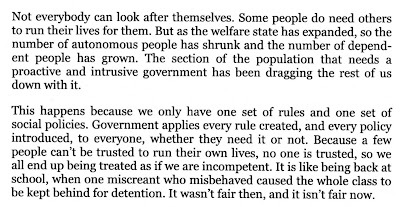 John Humphreys, in his essay ‘Declaring Independence’, says that people who can pay for their own lives should be able to ‘declare independence’ from the nanny state. 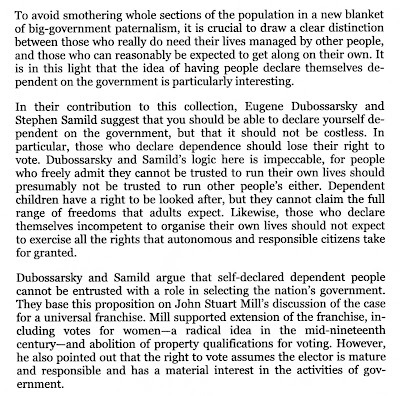 On the other side of the coin, Eugene Dubossarsky and Stephen Samild, in their essay ‘Declaring Dependence’, suggest that those who need constant help should be able to declare themselves dependent on the government, but that this is conditional on forfeiting their right to vote. Remember when you were all bowled over by the Maori Party slamming benefit dependency? Tariana Turia was guest at an ACT conference talking about ending welfare dependency wasn't she? I don't know for sure because I didn't go. I have never bought it. Growing the Maori population is far more important to Tariana than being self-supporting or children having intact two parent families. That's probably a colonial Pakeha construct anyway. Here is an interview (starts at 32.29) with Pita Sharples on the back of National's new welfare policy. Sharples doesn't at all like work-testing DPB mothers when their youngest turns six. He blames kids running amok on both parents working, rejects the philosophy that assumes people need to get out to work, rejects work-for-the-dole, "dumb jobs" that people "don't like" and wants WFF extended to beneficiaries. The only aspect of National's policy he likes is the lifted abatement rates! The interviewer, Justin du Fresne, says afterwards he is "thunderstruck" at the change in Sharples's views but probably quite rightly suspects the transformation has something to do with the impending matter of a general election. Well, the statistics show just over 38,400 single parents with kids aged over six are on the DPB. Less than 4000 have been in receipt of the benefit for more than 10 years, Key’s idea of “permanent entitlement” I presume. Frankly, less than 4000 adhering to the government breast on a more or less permanent basis is extremely few. The statistics he refers to only describe the current period spent on the benefit. As people cycle on and off it, the cumulative time spent on welfare will be significantly longer. Professor Bob Gregory, Research School of Social Sciences, Australian National University, showed that Australian single mothers were spending on average 12 years welfare dependent. ON AVERAGE. Here is the truth. Nobody knows how long single mothers are staying on welfare in New Zealand because the prevailing administrations haven't wanted to know. It's only taxpayers money after all. Same source as their wages. Don't rock the boat. 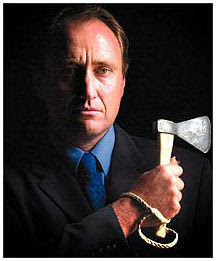 Larry Williams talks to John Key about National's welfare plans. I follow explaining why they are tired and gutless. National's plan to deal with the huge DPB problem is tired and gutless, welfare commentator Lindsay Mitchell said responding to John Key's speech today. "If DPB recipients want to avoid work-testing when their youngest turns six there is an obvious solution. Make sure their youngest is always under 6. Children are already added to existing benefits at the rate of around 5,000 a year. This policy further encourages people to have children for no better reason than to allow the parent to avoid work. " "Even worse, National's approach does nothing to stop very young women being enticed on to benefits. The teenage birthrate has been increasing since 2002 with most young mothers going on welfare. Up to half of current DPB recipients started on welfare as teenagers. A period of six years before having to think about a working future is a long time in the mind of a teenager. " "At a time when the economy is heading south and unemployment is growing, the major priority must be to discourage people from becoming single parents in the first place. National's approach actually says you can be a single parent on a benefit as long as your youngest child is 6 or under. That's a message heavy on the wrong incentives." I will refrain from a lengthy comment on this seeming piece of timidity from National until I have read Key's imminent speech. There is one thing in particular I am looking for. Just under 20 per cent had been in paid work in the previous 12 months and one in three had a child under six. About 36 per cent of all DPB recipients had been on the benefit for between one and four years. Eleven per cent had been receiving it for 10 years or more. The percentage of recipients caring for a child aged 6 or under is 60.8%. I make that closer to two in three. Also she writes that 36 percent had been on the benefit for between one and four years. I would add "this time". Many cycle on and off benefit and those statistics refer only to the current spell. The number receiving the DPB for ten years or more would be much higher than 11 percent if cumulative time is measured. My first look at Paul Quinn, National's Hutt South candidate, was afforded by a campaign meeting hosted by the Forest and Bird Society on Thursday night. I think he has a short fuse which Trevor Mallard is quite good at lighting. Should make the meetings interesting. Murray Smith, standing again for United Future, is no less self-important as a mere candidate rather than MP. I admit to struggling slightly with matters environmental but don't, as a consequence, compose answers so loosely related to the questions that I could be mistaken for a Minister at question time. The audience is not that dense. More comfortable yesterday addressing the Catholic Diocese in Palmerston North on the issue of poverty in Aoteoroa, I found the idea of ending lifestyle welfare met with some approval. I was the only candidate/MP to go near the subject. Massaging the audience really does seem to be the number one objective for some. As an exercise in studying human nature, campaign meetings provide wonderful fodder. So good I sometimes have to remind myself to concentrate on the matter at hand. But I am warming to the process. Yesterday a lady specifically addressed her question to the National candidate. "Will National be abolishing the Ministry of Women's Affairs as Don Brash promised at the last election." She was clearly aggrieved by the thought. Getting impatient with the National candidate bumbling apologetically that they ...er.... wouldn't, I interjected "No. They won't. But we might". The looks on both their faces were worth it. Nah. It's clever but not that clever.